Welcome to our guide on using accent wall colors for the home including color combinations, matching furniture and decor. Everyone loves to have colors around. 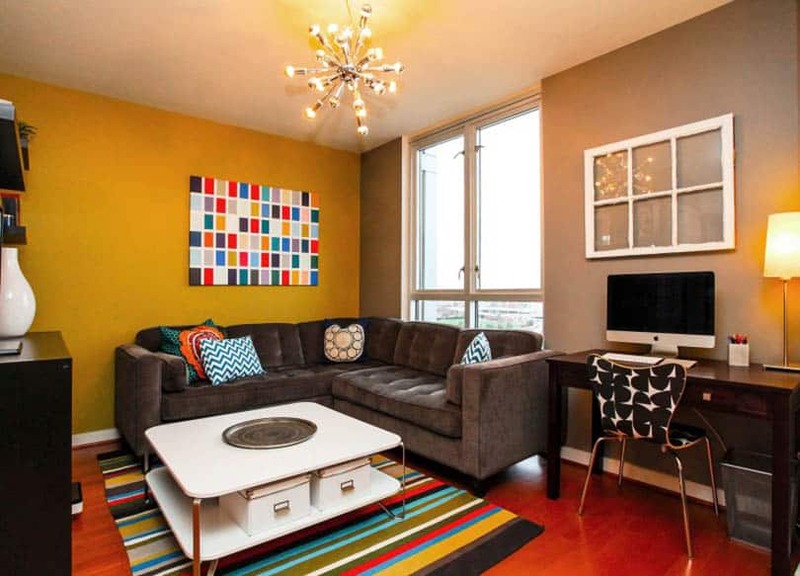 When it comes to decorating your home, colors play such an important role. No matter how much you stock your home with expensive furniture and décor, sometimes the right use of a single color is all that you need to make your home look appealing. Colors have the power to give your home its personality. The question is how well you are able to do it? Too much colorfulness might spoil the plan too, making the colors force sensory overload and appear overbearing. That’s why accent colors are planned and used carefully around your home in various elements to bring out the true essence of the color. Accent colors are definitely one of the best ways to accentuate your home and give it much desired appeal. We often adore seeing accent colors being used in hotel rooms, fancy restaurants and homes but when it comes to using it in our own homes, we hesitate. It leaves us wondering about a lot of questions pertaining to the right colors, the right amount and the combinations. 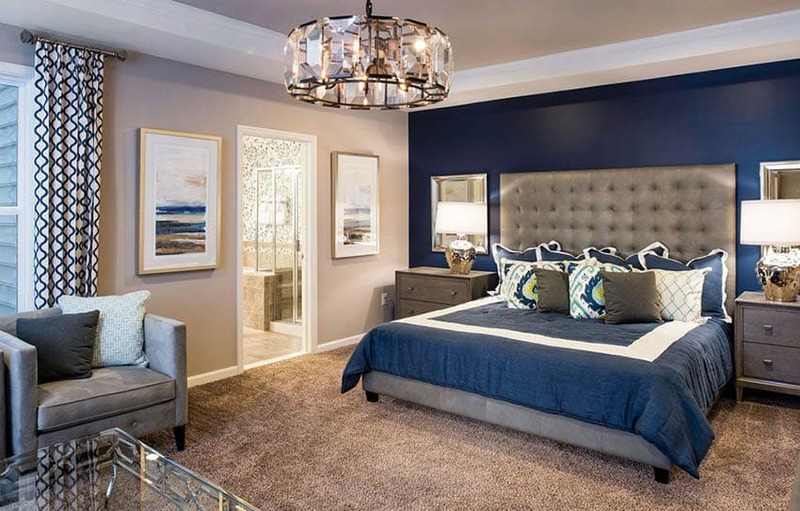 Using accent colors seems like a big commitment and it is, that’s why it is essential that you carefully select your accent colors to enhance your room’s overall color scheme. 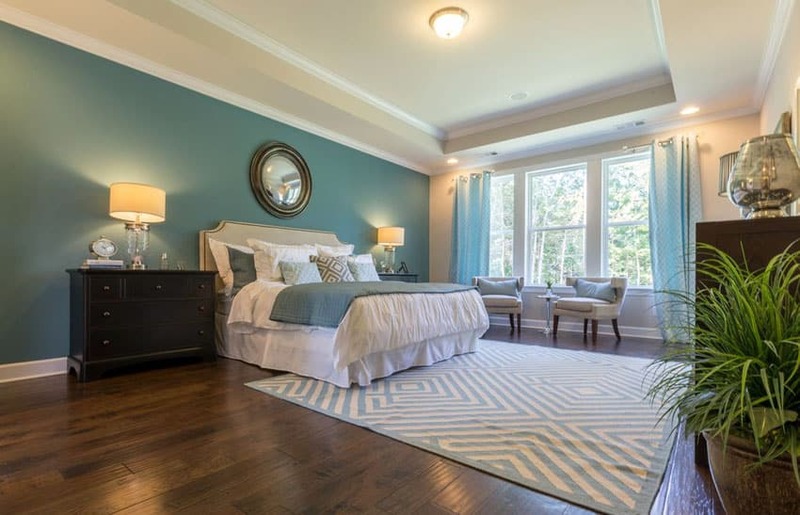 When you think of accent colors, you expect a sudden pop of color in your room. 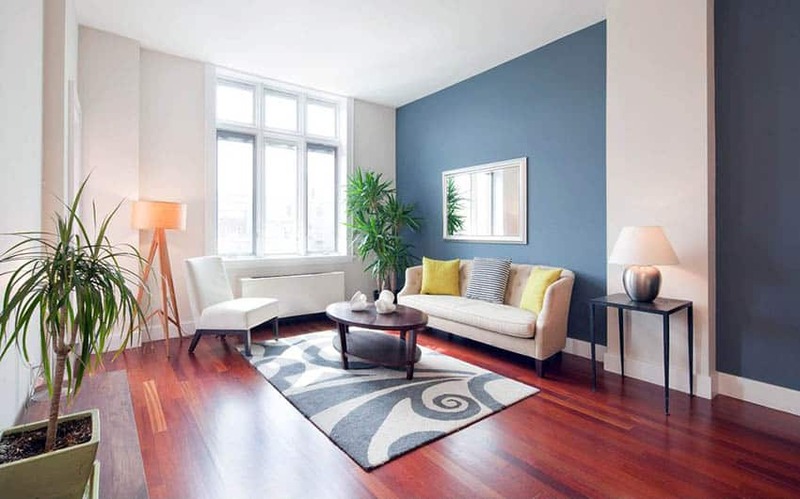 A lot of people think that the use of contrasting colors in the décor ends up causing visual disruption or separation. But the truth is, it does the exact opposite. When used correctly, accent colors give your home a put together look. The most risk free way of using colors is following the 60-30-10 rule. When you think of your living room, the color that you want to be the base color is the one that has the largest portion in the color palette. 60% of your room will hold this color, which mostly goes on to the walls. People preferably like it to be neutral tones like white, beige, cream or pastel hues of mints and aqua blues if you do not mind some colorfulness around. 30% of the color is the one that breaks the monotony of the base color and adds some appeal to your space. This color goes to the upholstery in the room. The rest of the 10% of the color is what acts as the accent color. 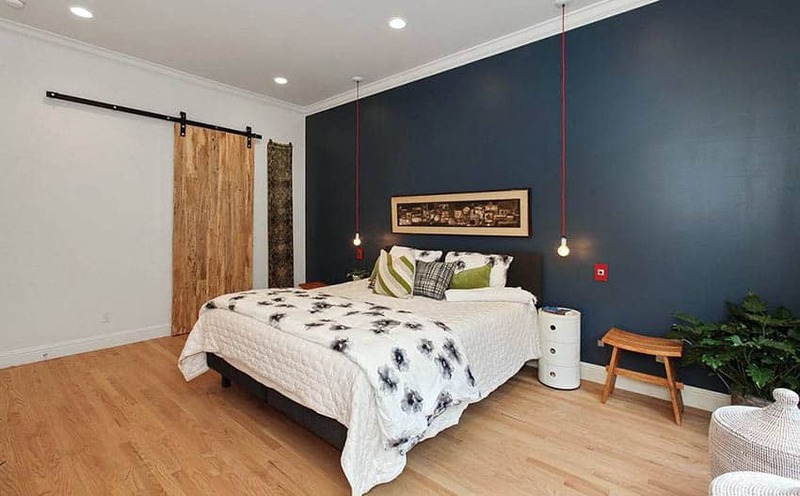 The accent color adds visual interest to your room and keeps the color scheme interesting even with its minimal usage. From the floral prints on the curtain to the rim of the flower vase, the accent color can be added with as much detailing to make it look well placed and subtle. 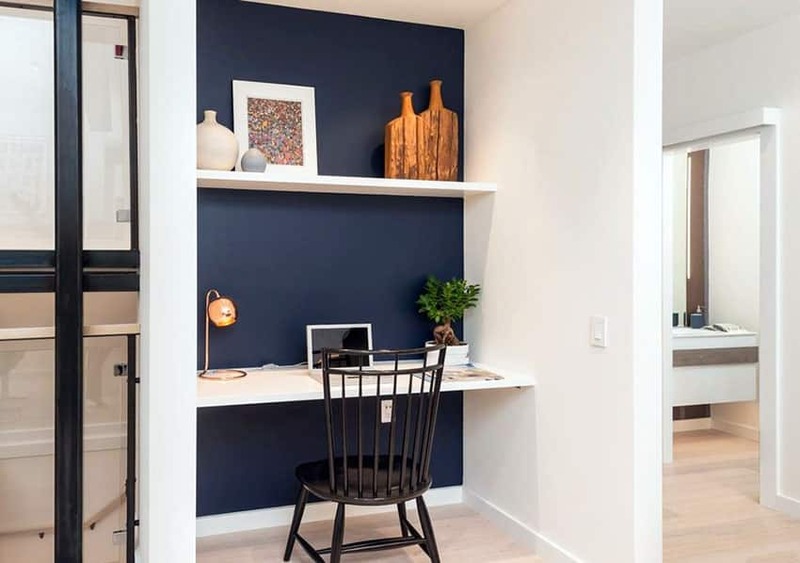 While this is the safest way of using an accent color in your home, you can amp it up a little bit by playing around with its amount. Accent colors can take up some portion of the base color too by being on one of walls or can even be used as the upholstery on the sofa. When choosing the location of the accent wall, many interior designers first look to see if their are any architectural features in the room to highlight with color. For instance, this can be design features such as a fireplace, built-in bookcase, wainscoting, nook or other architectural element. Color can be used effectively to highlight the feature and make it standout, further enhancing it’s visual appeal. 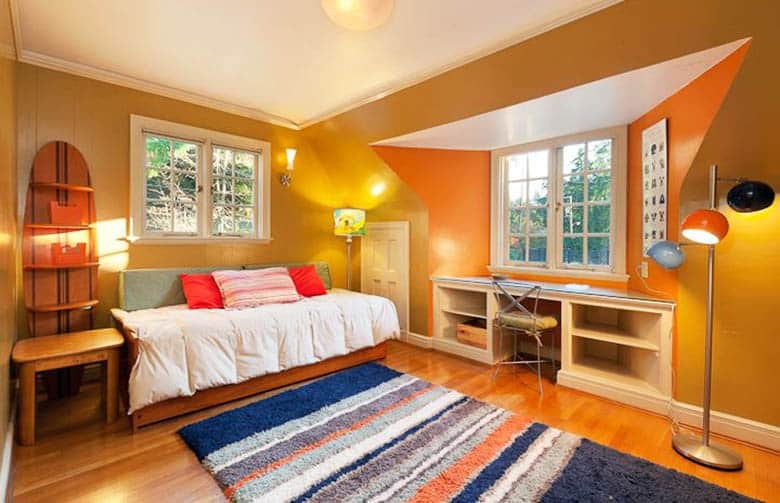 Accent walls have been the most popular methods of adding some color drama to living rooms, bedroom and even bathrooms. Using an accent color on the wall adds depth and personality to the room. 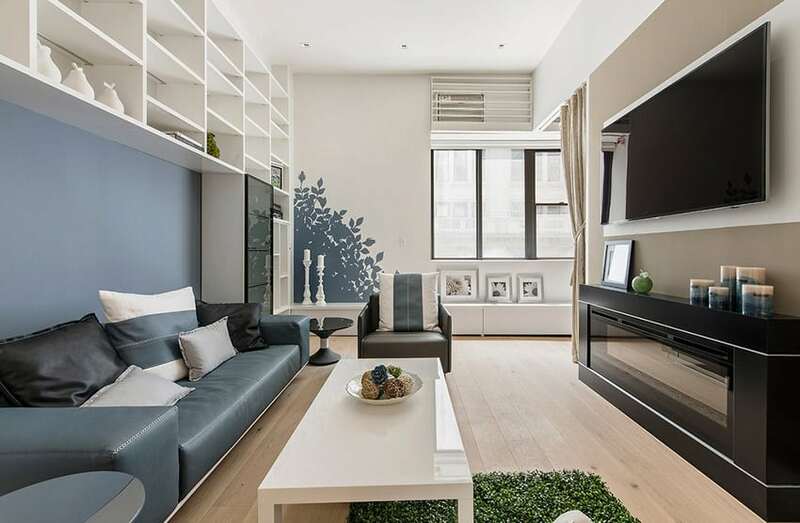 For living rooms, accent walls can be just perfect. The living room is where you spend most of your time entertaining guests and enjoying a good time with your family. Put in some extra efforts in making it an extension of your personality. 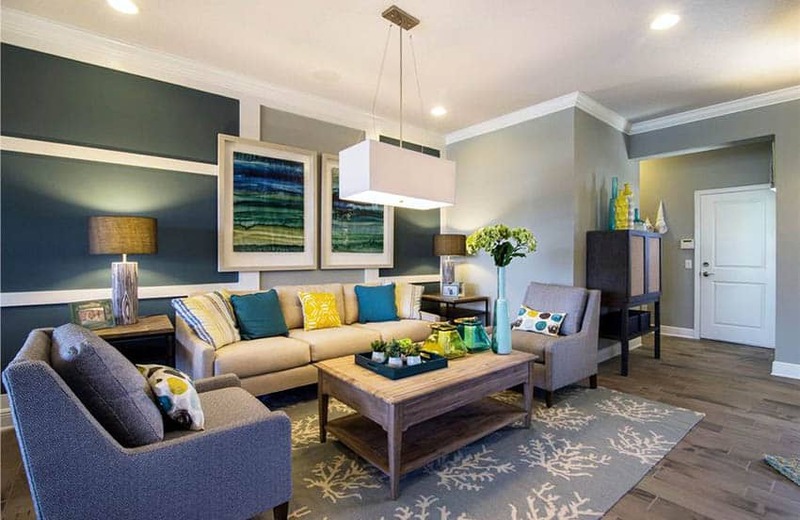 For a peaceful yet stylish atmosphere, shades of green & blue as accents walls works the best for living room. Belonging to the cooler shades on the color wheel, greens and blues are popular choices to create a calm and relaxing set up in your living room. However warm tones like shades of orange and yellow are also loved as accent wall colors for living rooms, since it brightens up the space and gives your space a chic look. Shades of red ranging from crimson, blush and scarlet to deeper tones like wine, maroon and marsala are super apt for spaces like kitchen and dining area. Red relates well with elements of food and dining, so spaces where you make food or serve food gets the right bit of drama with an accent wall carrying a shade of red. When it comes to accentuating your bathroom walls, your choice of color can be totally versatile. Neutral color shades have been popular picks for bathrooms. But that doesn’t mean you cant add color here. While the base color usually is white, grey or beige, you can choose anything from blue, dark grey and black to lighter and brighter shades like yellow, mint green and aqua blue as accents. Accent furniture is your way forward to creating a home that is impressive right at the first look. While a lot of people like accentuating the décor by popping some color on the walls, accent furniture is for those who are in for some serious color commitment. Giving your furniture accent colors is not an easy decision, but when done rightly its something that would define your space and your personality. For homes that have mostly whites and off-whites in the decor, its quite easy to choose the accent furniture color. Since white blends well with every color, you can pick anything from a deep blue sofa in your living room to dark brown wooden finish dining table. For homes with pastel colored walls like yellow, mint and powder blue, it would be perfect to opt for a dark shade of the same color for your furniture. Think an emerald green painted console table set against a fresh mint green wall. The layering of shades over each other is one of the best ways of creating a harmonious home. If your home has darker colors on the walls like navy blue or marsala, your accent furniture can be in rustic white to make an impact amidst the dark walls. You can also make things a bit more fun by adding prints instead of solid colors. 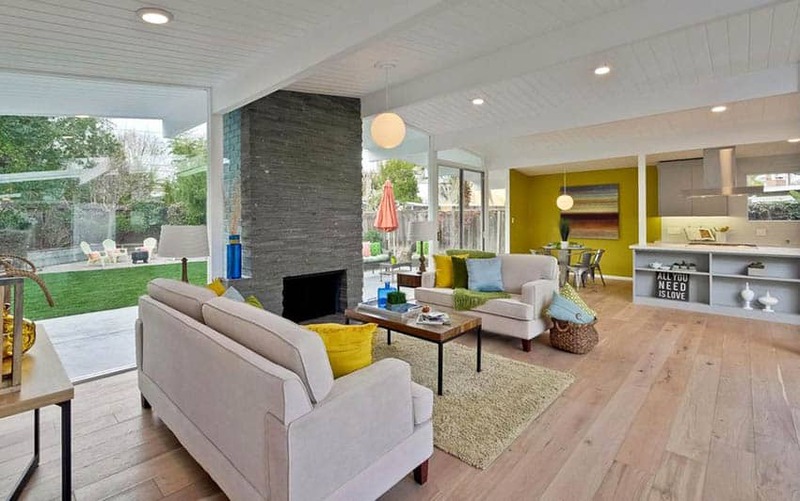 For example, a bright home with yellow walls can have an ikat fabric or floral print sofa in yellow and grey combination that is chic and impressive. Another option is to accessorize colorful prints with a throw blanket or pillows. A home with an accent wall undoubtedly strikes a classy statement. But what makes that happen is the right choice of colors. Getting an accent color for your walls or your furniture or other décor accessories needs to be a well thought decision. 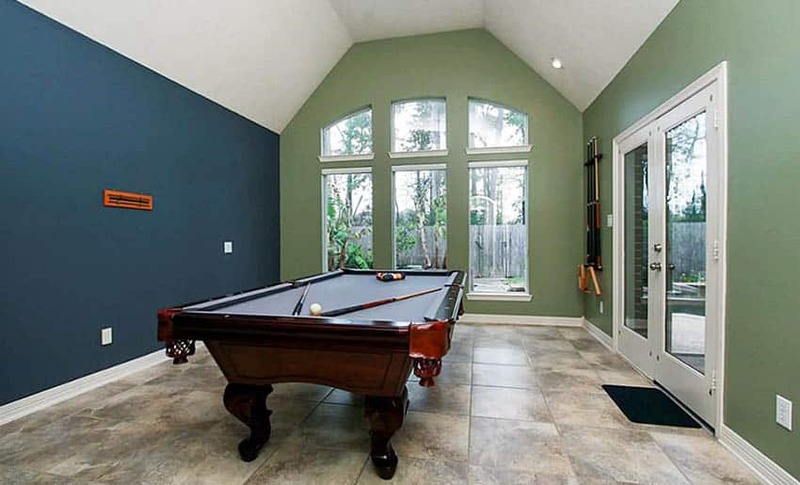 Colors tend to combine well with certain other colors and presents a home that is blended well. 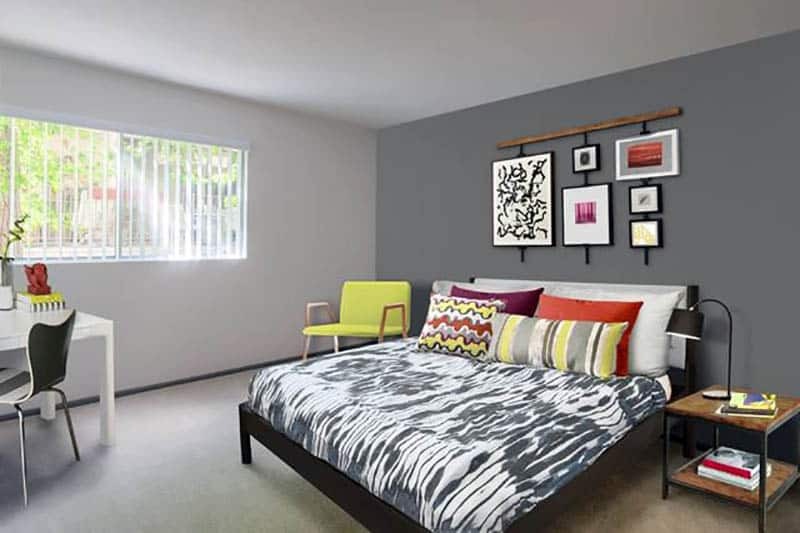 Grey Walls – What accent colors go with gray walls is one of the most popular questions regarding color combinations. A popular trend when using gray, griege, beige or other neutral primary wall colors of a light to medium shade, is to balance them with strong accent colors. Grey walls and yellow accents are a very bold combination, which is loved by many décor enthusiasts. One of the best classic color combinations, subdued grey and attention-seeking yellow is for the ones who like a room design uniquely balanced. A grey sofa with yellow throw pillows is a classic example of how the bright color can blend effortlessly with the neutral grey. This contemporary living room features a light gray primary paint color combined with a rich green color with attractive results. Throw in some additional pops of color with such as yellow and green pillows and colorful artwork and you have a cohesive design. Grey also works well with shades of blue to create a peaceful and relaxing home. For a more glamorous look, try combining grey with magenta. Brown Walls – If you are looking out for accents in a home with brown walls, the shimmery gold is a popular pick. Brown being an earthy tone works best in combination with most royal shade itself, gold. Your accent in a living room or bedroom with brown walls could be anything from gold damask prints on one of the walls to a large ornate gold-bordered mirror. Beige Walls – For homes with lighter beige walls, the accent color can be bold and poppy. Beige being a muted tone it can be balanced with shades of reds as accents or other strong colors. A living room with beige walls can be stylishly accentuated with a maroon sofa set and curtains for an elegant appeal. Beige or tan wall paint also looks great when combined with a variety of blues including turquoise, teal, navy and a mix of yellow and blue. Green Walls – Green represents being in nature, renewal and relaxation and a room of this color can be complimented by a variety of colors. Some of the popular combinations with green are white, gray, blue, pink and beige. One color you may want to avoid using with green is red as it’s closely associated with Christmas. 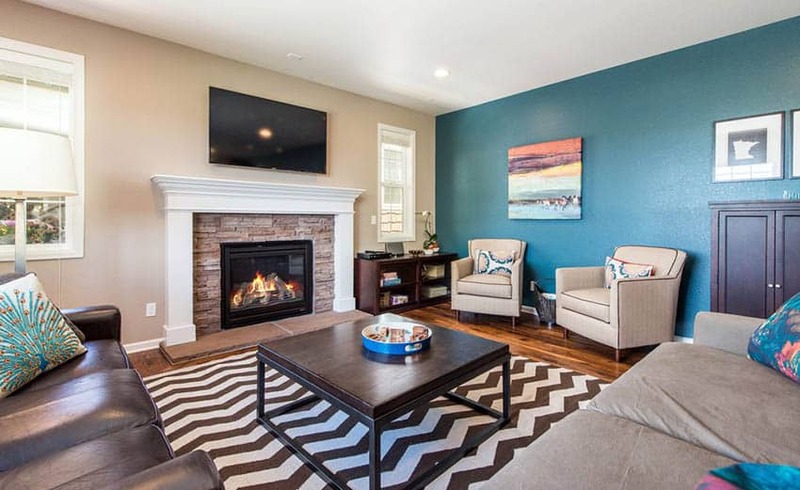 Blue Walls – Blue is one of the favorites when it comes to home décor. From carrying a cool undertone to offering a peaceful & calm atmosphere with its presence, shades of blue can be quite exciting to work on. A lot of colors blend well with blue but nothing like two cool tones coming together. 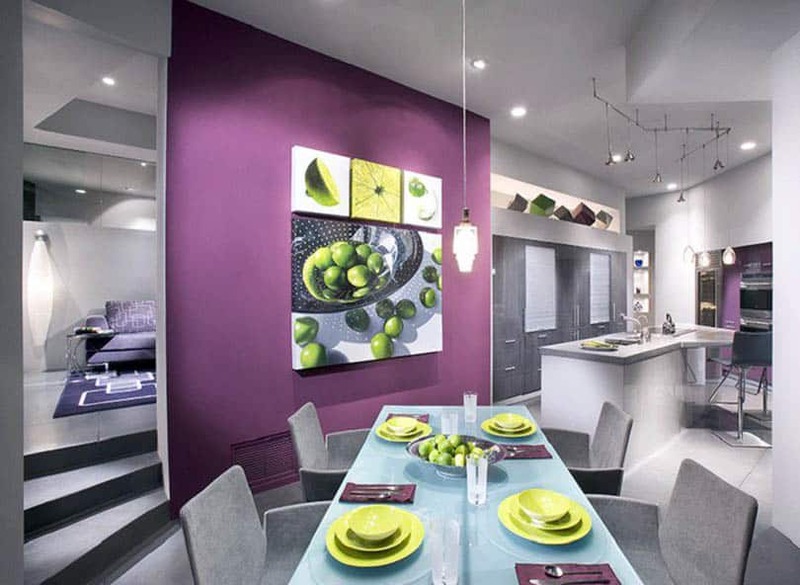 This blue room combined with a purple accent wall makes for an alluring design. Purple decor pieces such as the large area rug, bed accessories and throw blanket help provide pops of the color throughout the layout. 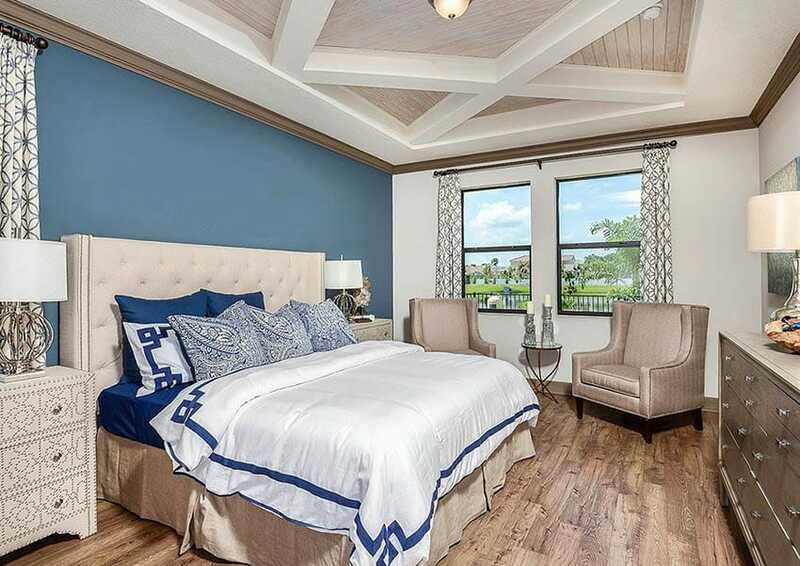 This kids bedroom showcases how you can use two types of blue colors to create an inviting design. 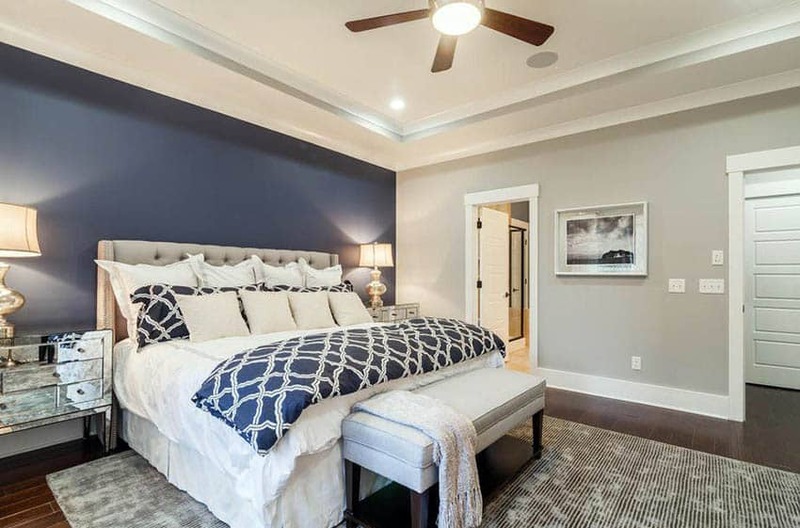 A light powder blue is used for the main wall color with a dark navy blue accent wall that really makes the white molding and decor stand out. This teen bedroom design pairs light blue painted walls with a pink accent ceiling. Other decor items further bring out the style of the room and give it personality. When matching pink and blue you can also use white, beige, gray and some greens with eye-pleasing results. Another option would be to pair blue walls with green accents and see a beautiful color combination come alive. Think of an emerald green chesterfield sofa amidst rich blue walls! You can also pair blue walls with red for a rich combination. Blue represents water & calmness while red stands for passion, the combination of the two will be something to look out for. It could work great in a bedroom, where you would love to set up a private and intimate atmosphere. Here we share an assortment of accent walls for different rooms of the home for ideas and inspiration. 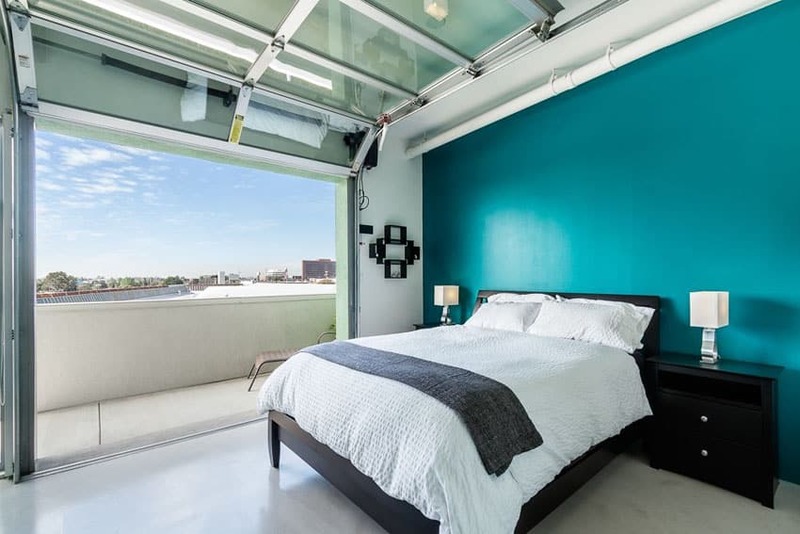 This interesting bedroom offers a roll up door to let in plenty of light. It’s got a primary white base paint for the walls with a bright turquoise green accent wall to give it plenty of character. 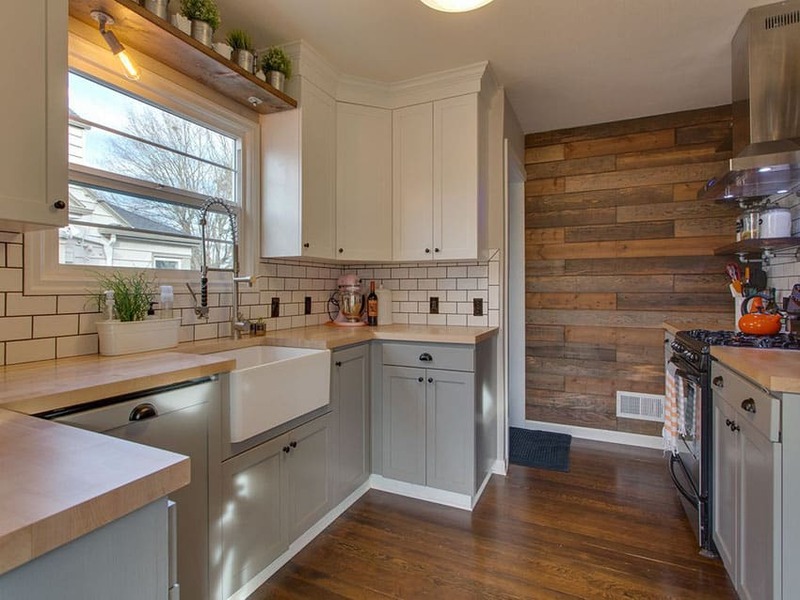 A reclaimed wood accent wall makes the perfect compliment to this cottage style kitchen with gray base cabinets and white upper cabinets. This small living room space has a Nantucket fog accent wall facing a beige painted wall with an adjacent wall with a stencil for added effect. A wall alcove can be an ideal place to create drama and showcase an illuminated stone accent wall. 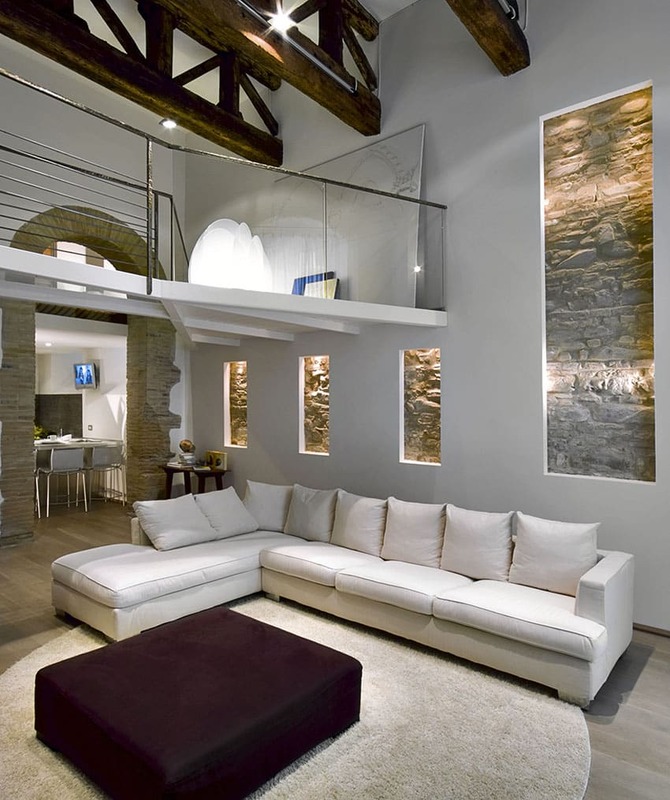 This luxury living room has a stone accent backdrop that cohesively blends the colors of the wall paint with the flooring to create an attractive design. 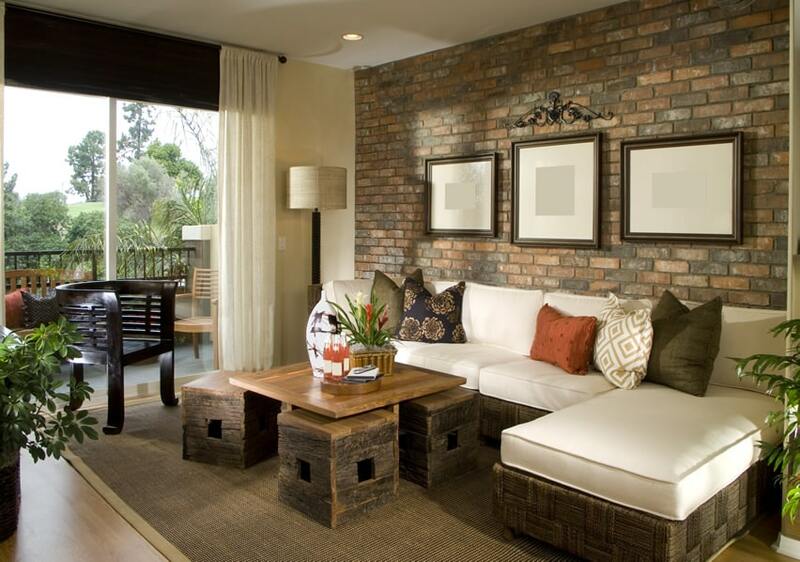 Brick accent walls can give your living room a stylish appeal that can be matched with a wide variety of paint colors. While picking just the right color to match your brick may be a challenge a few of the best paint colors are mint green, mustard yellow, bright red, white and tan. 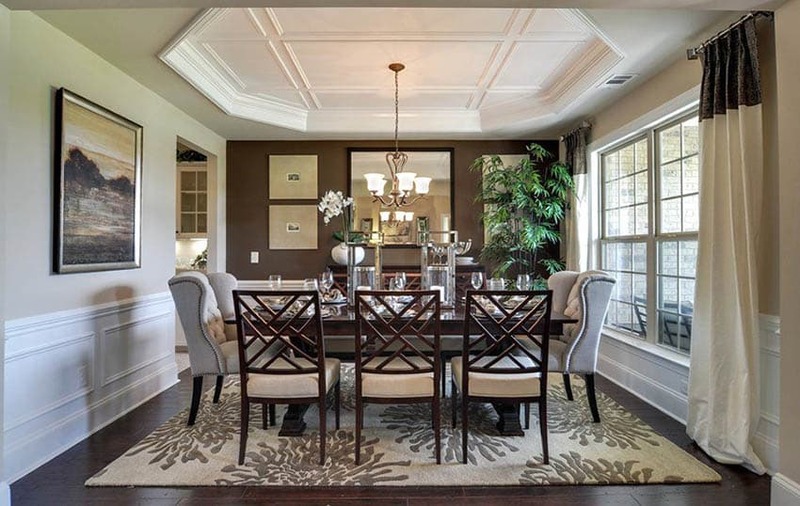 This elegant traditional dining room has a white wainscoting with a beige paint for the walls combined with a mocha brown accent wall. A white tray ceiling, chandelier and large picture window helps to brighten the space and offset the brown of the paint and in the wood flooring. This modern kitchen is full of character with its gray cabinets and furniture contrasting against a bright purple accent wall and colorful decor. 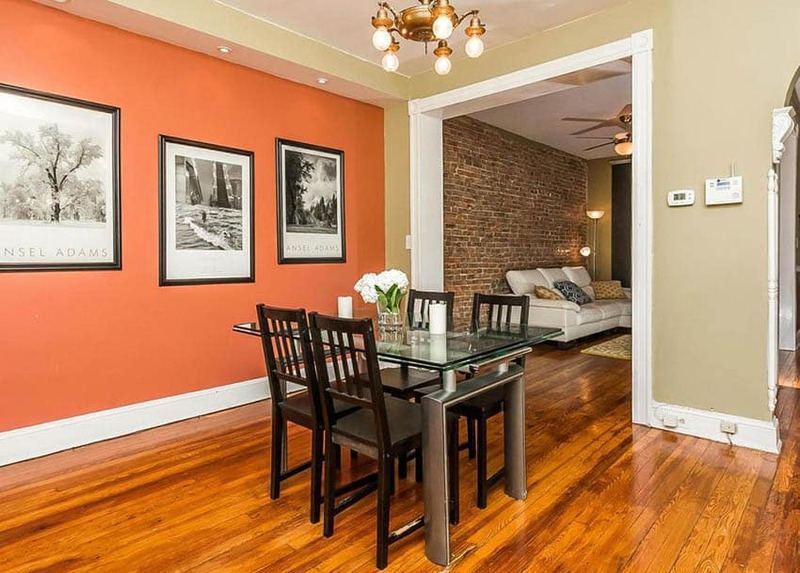 This dining room pairs tan with a bright orange accent wall. Hung artwork helps to calm the orange theme and tie in the white elements found in the base molding and trim. 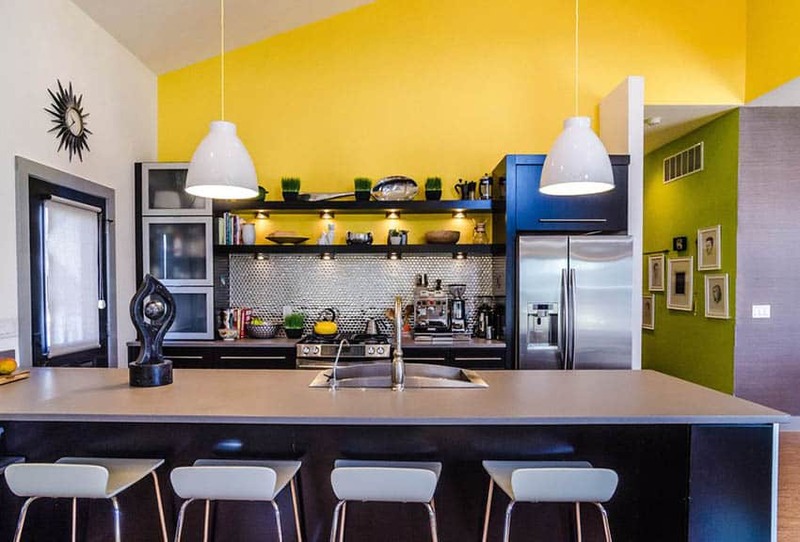 This kitchen boasts a variety of accent colors with its bright yellow paint above a stainless steel mosaic backsplash and next to a tropical green hallway. 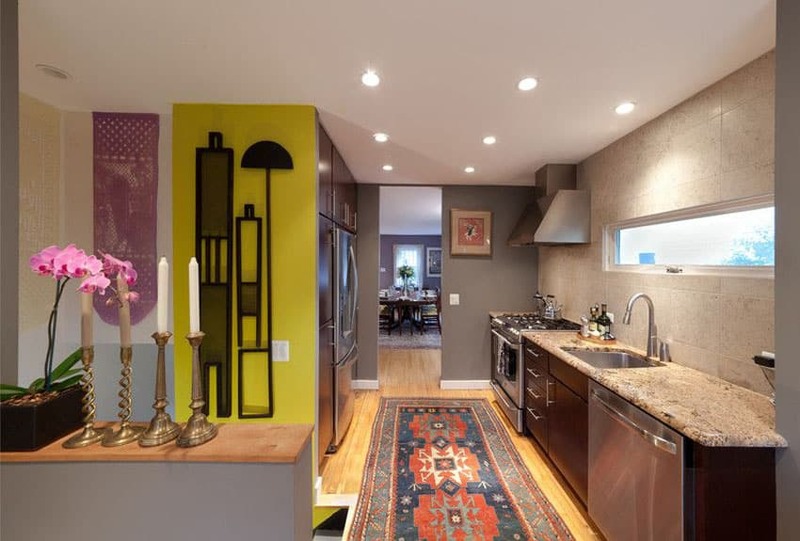 This eclectic galley kitchen has beige tile walls with gray paint and a yellow accent wall. 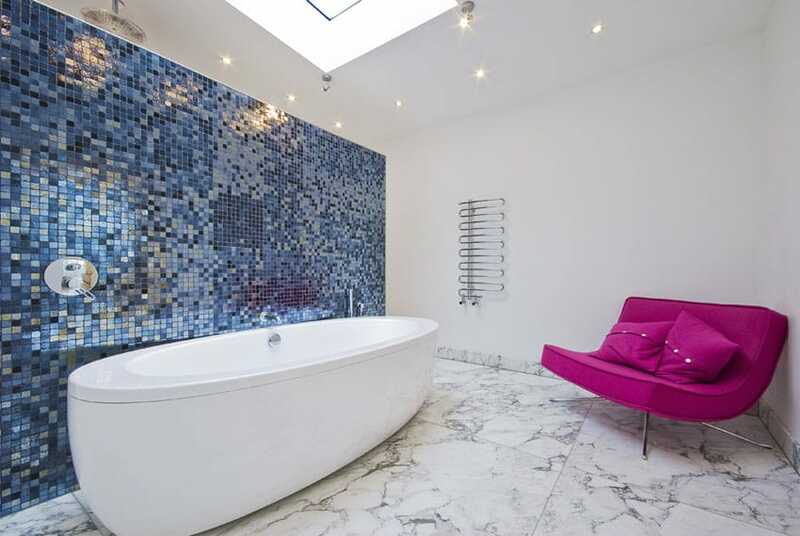 Recessed lighting throughout keeps the space well lit and further enhances the pop of color. 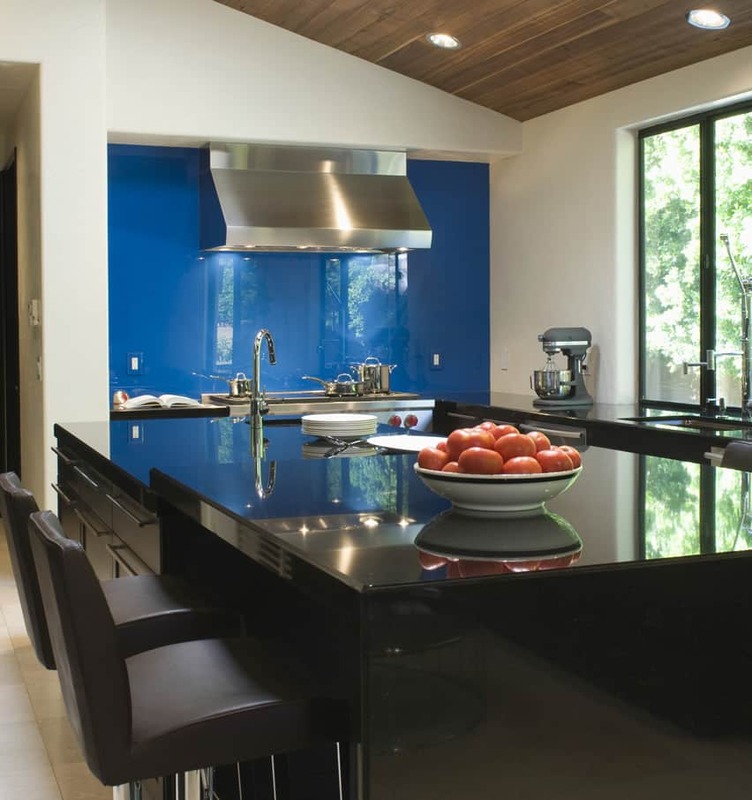 This modern kitchen features a blue glass backsplash that looks great paired with white and dark cabinetry. 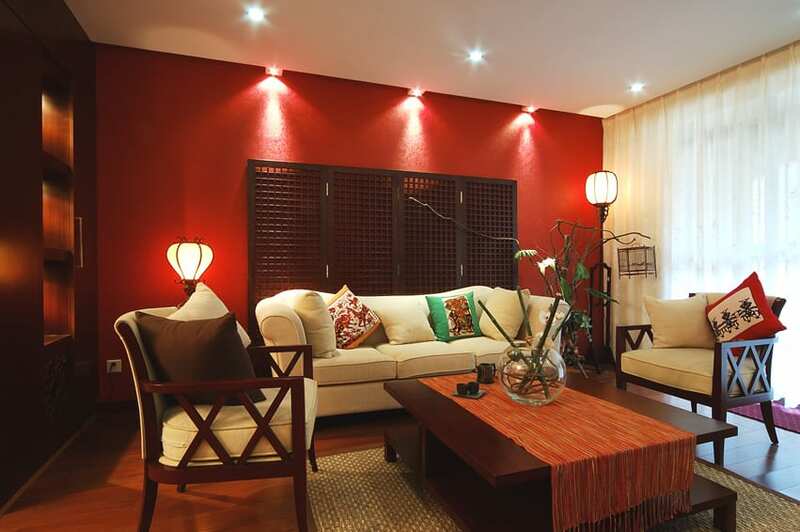 An Asian inspired living room with a rich red accent wall that is offset by plenty of lighting, a bamboo area rug, cream color sofa and cushioned chairs. A wood room divider is positioned against the red wall, further highlighting its Asian design appeal. 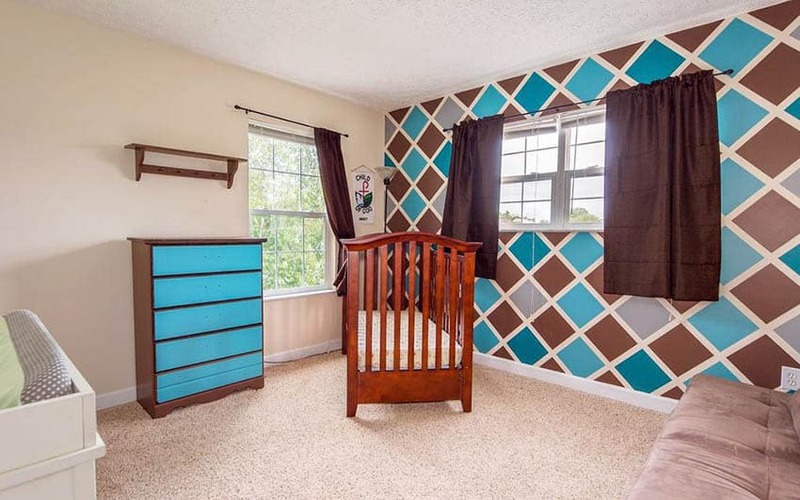 This fun child’s nursery is painted in beige with a whimsical blue, brown and white checkered pattern. Color coordinated brown curtains, couch and dresser provide additional accent to match the overall theme. This master bedroom offers a black accent wall contrasting against the off white color of the adjacent walls. Light wood flooring, recessed and drop lights help keep the black accent theme from becoming too overwhelming to the senses. This cozy living room design is painted primarily in beige with a turquoise accent wall. 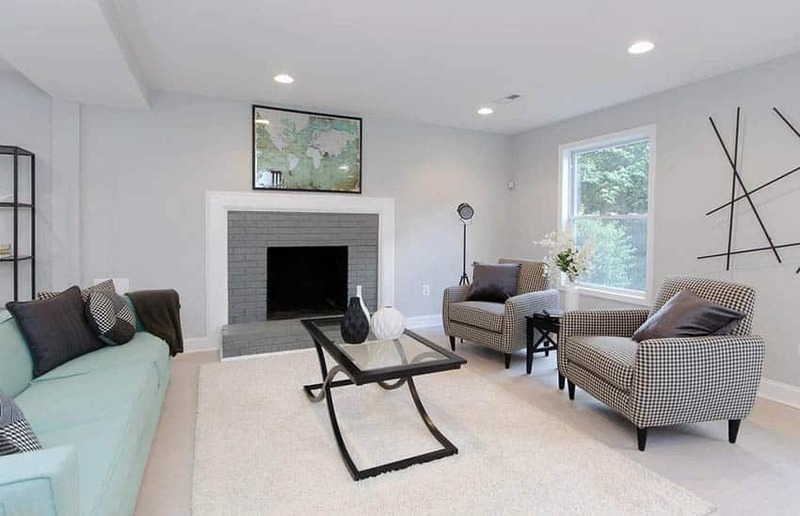 A brick fireplace with a white painted mantel provides another nice touch that is warm and inviting. Want even more designs? Visit our accent wall ideas page for more creative ways to use color, texture and patterns to generate visual interest.